Manchester United eyeing €50 million swoop Manchester United have enjoyed a fine weekend after their win over Liverpool at Anfield after three years. Manchester United have enjoyed a fine weekend after their win over Liverpool at Anfield after three years. They have kept their fourth spot in the Premier League and are one point behind Arsenal. The Red Devils have now restarted to search talent in the market for the summer move and the reports revealed that centre-back Nicolas Otamendi has been closely monitored by United. The 27-year-old joined from Portuguese side Porto in 2014 but spent his starting months on loan at Atlético Mineiro. He has been now a regular player for the Spanish side, has played 25 games in La Liga. He has scored three in them. 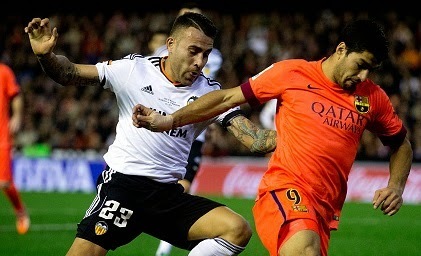 Louis van Gaal has shortlisted several defenders for the summer move including Otamendi who has a €50million release clause on his current contract as per the reports. The reports believe that United boss LVG is eyeing him to sign to fulfill any of the void left by the legendary defender Nemanja Vidic and Rio Ferdinand last summer. The reports strongly claimed that the Manchester side have sent the representative to discuss with his agnet over the possible summer move. The Argentinean is an experienced player, he has played more than 200 competitive games.